Palmer Engineering designed the Raccoon Creek Bridge, which received the Grand Conceptor Award by the American Council of Engineering Companies (ACEC). This award is the highest honor given at a State level. The bridge design was entered in the national level competition in Washington, D.C. and was recognized as a finalist. The bridge, actually a pair of twin bridges over the Raccoon Creek Valley, is part of the new alignment of US 119. 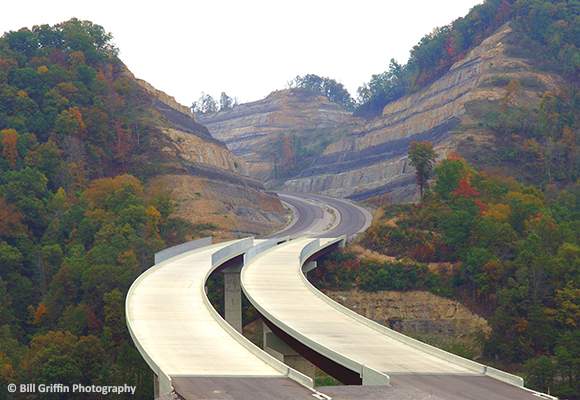 The steep terrain, curving roadway, and crowded valley made for a true test of engineering innovation and will provide the residents of Pike County a tremendously improved route to Charleston, WV. The new corridor will replace the existing winding, steep, two-lane version of US 119 with a safe, modern, four-lane, limited-access expressway. Access to schools, fire stations, police services and hospitals will be improved. Additionally, the economic development of the region will be significantly enhanced. Manufacturing and shipping businesses that rely on trucking will be attracted by the efficient road system. The bridge, which is owned by the Kentucky Transportation Cabinet (KYTC) Pikeville District, was built by Bush and Burchett, Inc., a subcontractor to Bizzack Inc.
From the beginning of design, the Raccoon Creek Bridge posed numerous design and construction challenges. The valley floor, 200 feet below the bridge, was already home to Raccoon Creek, a railroad, a coal tipple, various small roads, and private residences. These physical elements left little room for the piers necessary to support the bridge, making it necessary for the designers to stretch the span lengths of the bridge. The longest of the three spans crossing this 1275-foot valley is nearly 400 feet. The geometry of the roadway also presented considerable challenges. Traditionally, bridges of this size would utilize I-shaped steel girders. But such girders, combined with the tightly-curved road would have caused excessive rotation of the bridge deck. This design would have led to driver discomfort and deck cracking. The designers at Palmer Engineering and the Transportation Cabinet decided to try a design previously unused in Kentucky: Steel box girders. These girders will provide far greater resistance to this rotation than I-girders. Erecting steel girders 200 feet above a valley floor with limited room for cranes also presented problems. To facilitate construction at such heights, temporary supports at the top of the piers were suggested by the designers. These “angel wings” proved to be a very effective and economic aid in the construction of the girders. The complexity of this project demanded the collaboration of all involved parties throughout the process. While the obstacles initially appeared almost overwhelming, engineering innovation, teamwork, and determination resulted in a solution that will serve the people of Pike County, KY for generations to come.